These tasty Chocolate Chip Cookie Bites come together in just minutes and have a secret ingredient - beans! 1. Preheat oven to 350°F and prepare 2 mini muffin tins by spraying with cooking spray. 1. Combine all ingredients except the chocolate chips in the bowl of a food processor. Blend for 1-2 minutes, until batter is well combined and fairly smooth. Pour cookie batter into a bowl and stir in the chocolate chips. 1. Divide the cookie mixture evenly among all the 48 mini muffin cups. 1. Bake for 12-15 minutes, until cookies are set in the center and just starting to brown around the edges. 1. 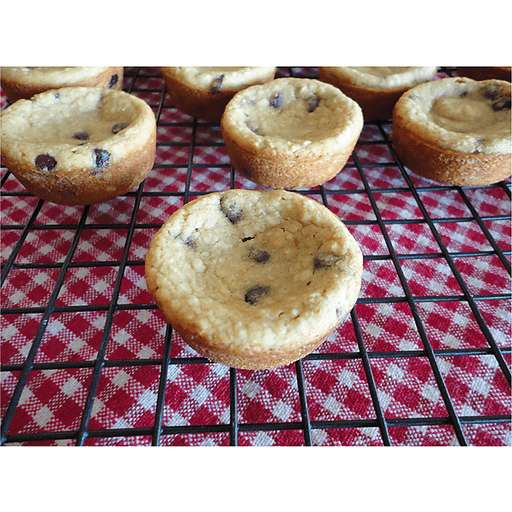 Cool cookies in the muffin tins for 5 minutes, then remove to a wire cooling rack to cool completely. For dairy free or vegan: Use Enjoy Life® mini chocolate chips in place of regular mini chocolate chips. For gluten free: Use certified gluten free oats in place of quick-cooking oats. Calories 150, Total Fat 3.5g (Saturated 1g, Trans 0g), Cholesterol 0mg, Sodium 120mg, Total Carbohydrate 27g (Dietary Fiber 2g, Sugars 17g), Protein 3g, Vitamin A 0%, Vitamin C 0%, Calcium 6%, Iron 6% *Nutritional values are an approximation. Actual nutritional values may vary due to preparation techniques, variations related to suppliers, regional and seasonal differences, or rounding.